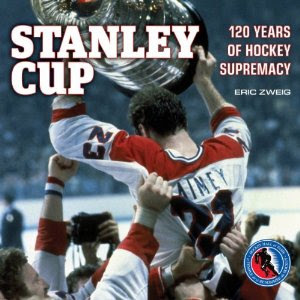 Stanley Cup: 120 Years of Hockey Supremacy is the definitive book on the history of the Stanley Cup and the championship teams that have won it. In honor of the 120th anniversary of the first winner of the Stanley Cup, author Eric Zweig has collected the details of every cup winner from 1893 to present. Hockey fans can chart the course of hockey history and revisit the dynasties and Cinderella stories of each and every decade. Zweig presents each Stanley Cup winner in an illustrated two-page spread, detailing playoff brackets, club rosters and playoff statistics, as well as providing stories and sidebars outlining the incredible journey each team took to achieve hockey supremacy. Presented between seasons are highlights of some of hockey's best and most controversial playoff moments, such as Brett Hull's "no goal" in the 1999 final or Bobby Baun's overtime winning goal for the 1964 Stanley Cup. Also included in this expansive volume are personal stories of some of the NHL's best playoff games as recounted by Hockey Hall of Fame legends Bobby Orr, Dave Keon and Ken Dryden, to name a few. Complete with a foreword by Phil Pritchard, the Keeper of the Stanley Cup, and packed with information and over 200 photographs, Stanley Cup is a must have for any hockey fan. Every few years we see such a book - same format, layout, idea and everything. Long time hockey book readers will recognize that. Regardless, there is enough interesting stories and a fresh new presentation here to make this book worthy of a good look through. Eric Zweig is the perfect storyteller to breath fresh air into this tried and true hockey book format.